Credit: morguefile.comBat are great insect eaters so we don’t want to hurt them, but they are not exactly invited guests right? So if you are wondering just how to get rid of bats in the attic that have invited themselves in without paying rent and now need evicting, here are a few easy tips to get started with. When we were building our house, we didn’t get totally finished and a portion of the porch roof remained open. We didn’t notice them right away, but one night while sitting on the porch a few bats flew by our heads and up into this attic space. I know bats are great for eating insects and other nasty pests, but I am not a fan of having them in my attic, so we took a two stage approach that has us all living in harmony now. Bat house – We purchased a few bat houses and placed them around the property in the trees, so that the bats would have a nice place to go once we evicted them from our house. They can eat their body weight in mosquitoes, so I didn’t want them to leave town totally, just a nice little nudge into the furthest part of the back yard! A bat house looks similar to a bird house, but it is long and the bat actually enters this house from the bottom. There are ridges inside for them to hang from during the day where it is dark and cool. They are usually made of wood. You can purchase them or make your own. If you make your own, don’t use varnish on them afterwards they don’t like the smell. Bright lights or Large Flashlight - Once we had a few houses up for them, we did some reading and discovered they didn’t like bright light too much. So, we simply set up a light on a timer that shone into the attic space. We randomly had it come on in the late evening and parts of the night, shining right at them for a good 5 minutes or so. The first night, they basically put up with it, then the second night we made sure it was on as it started to get dark outside, actually just before dusk. We hoped this would put them off heading inside, which it seemed to do. Having the light go on and off definitely bothered them and so a few at a time simply left, until we checked one afternoon and there were none to be found in this space. This happened in a few days. Remember they like your attic because it is warm and dark during the daylight hours. So, if you mess with their sleep routine they will find somewhere else to hide. Attic Access - We then quickly covered the space and blocked all entrances. We then looked around the rest of the house to make sure there were no other ways of getting in. We then noticed the bats in the trees in the back of the yard, and they seemed to have discovered the bat houses. Creating a disturbance in their routine with noise, and light seemed to put them off roosting there. We didn’t want to hurt them at all, but we didn’t like the idea of them roosting in the house either. If you find that you have bats in your attic but are not sure whereabouts, you could stake them out. Staking them out - Simply have a few people watching the roof line of your house at dusk, they will come out for feeding. Once you have discovered which part of your attic has become their new house, then you can take a strong flashlight to the attic and shine it in that area of the roof. You will see them hanging out on the underside of the roof (as they don’t really like insulation much as it irritates them) they like the wooden parts. Shine the flashlight at them and get them to leave. Once they have left (they usually hang out together) and you see the cluster fly out for their nightly feeding, you can then quickly seal up the area they were getting in. Bats like spiders do not need a very big gap, so you may not have a gaping hole in the eaves, but just a slight opening between the eaves and the roof can be enough for them to get inside. This is when you get out the ladder and the caulking gun and seal up those areas while they are out. You don’t want to do this while they are still in there or they will die in your attic which is cruel. Depending on the type of bats you are dealing with, you may be surprised to find the area they are getting in. Ours was very obvious because we had a large opening that needed to be closed, but we had seen them trying to get in near roof vents too. Professional Help – If you are totally scared of bats, or squeamish as they do have mice like bodies, then call in professional help, they will trap them and re-release them somewhere better. You don’t want to be poisoning them, as this is just cruel and they are an important part of our pest control. Don’t try and handle a bat, as they do carry parasites, if you have one that has managed to get into the living area of your house, then you simply need to open the windows and with a net try and guide him to a window then quickly shut it, he really doesn’t want to be around you either! Sick Bats – If you find bats in your house wandering around looking disoriented or during the daylight hours, then stay away from it and call animal control. You could throw a box over it to keep it still. Some bats can get rabies so you want to be careful. How to Get rid of Bats in Attic? – Basically upset their routines with light and noise, and then give them some alternative living arrangements! 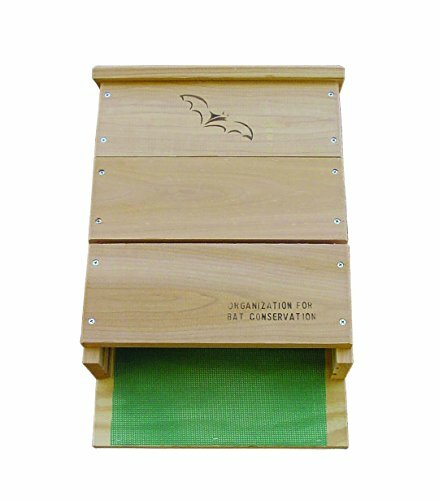 Great Bat House that Works! Very eco-friendly advice. I appreciate that! I really appreciate the information in case we ever have that problem again. It wasn't a lot of fun getting them out the three times they got into our home. It seems it was the year for bats to visit people, it also happened to a couple other people we know.